We built a new website last week for a wine storage company who are experts in storing wine at home. That supply a range of wine storage solutions including modular wine cellars, wine display cabinets and wine fridges. 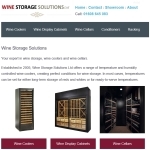 Chipping Norton based wine storage company and wine storage experts who are the sole UK distributor for the Transtherm range of wine storage cabinets and wine coolers.